Dual MTR-75 review | What Hi-Fi? The arm automatically lifts and returns to its rest once it reaches the end groove, and you can press the stop button any time during playback. That’s handy for when you don’t want the needle sitting in the run-off groove for ages, and ideal for those who aren’t confident with placing the needle precisely themselves. Also topping the features list is the built-in moving magnet phono stage, so you can plug the MTR-75 straight into a pair of powered speakers. There’s a pair of switchable line level outputs available if you prefer using an external phono stage or the one built into your amplifier. Dual also provides buttons to select between two speeds (33.3 and 45 rpm) and a toggle switch for choosing between 7in and 12in records. The control buttons are plastic, but they work responsively. Other features include a USB type B output for ripping records into digital files. It works smoothly. The recorded digital files sound a touch thin, but they have the same upbeat character as the turntable itself. The automatic function does take away some of the tactility of using a turntable, but don’t fret, as the Dual requires some assembling once you take it out of the box. It’s not quite as plug-and-play as some of its rivals, but everything you need is provided in the box: aluminium platter, belt, rubber mat, tonearm, cartridge, and counterweight. You just have to put them together. It might be intimidating to a complete novice at first, but the instructions are easy to follow. The drive belt is simple to attach, the headshell screws in securely to the tonearm, the dust cover fits neatly – it only takes a matter of minutes. Dual recommends you set the counterweight between 3g to 3.5g for the supplied Audio Technica cartridge. On our sample, however, the markings on the counterweight weren’t particularly accurate, so we’d set the weight closer to the lower end of the recommended scale. Build quality is decent. The black satin finish is neat and everything is firmly in place, but the Dual does feel a bit plasticky. 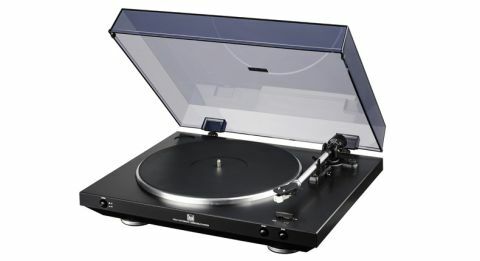 Turntables for a similar price, such as the Audio Technica AT-LP5 and the Sony PS-HX500, are built to a higher and sturdier standard than the MTR-75. We’ll get straight to the point: the Audio Technica and Sony turntables sound better than the Dual. They’re more articulate, deliver textures and deep basslines in a way that feels tactile, and have a strong sense of weight and authority that guides music along its dynamic ups and downs. But the Dual isn’t far behind. In fact, the MTR-75’s lively and pleasant character will have you happily spinning records for hours. There’s enough detail to capture the wistful, bittersweet tone of Nick Cave’s vocal in Into My Arms The melody is fluid and there’s a warmth that’s lovely to listen to. It may not be the most transparent or nuanced performance, but the Dual’s easy-going approach means it plays well with most genres. Songs with piano are challenging for most hi-fi kit, but the Dual takes on the resounding and delicate notes in People Ain’t No Good with as much skill it can muster. The leading edges are clear and timely, and the top end is smooth without being bright or harsh. It doesn’t quite reach the hefty depths needed to truly convey the solid clunk of a piano note, but what it can do is convey the varied emphases put on each key being pressed. That alone keeps us listening with interest. On the flip side, Alice in Chains’s Would? needs a meatier bassline, and the rasping, grungy vocals could have more attitude. But the MTR-75 has a decent way with dynamics, meaning it doesn’t run the risk of being demoted to background-music duties. Spin The Sorcerer’s Apprentice by Dukas, and we’re caught up in the sprightly, tension-filled orchestral piece. The Dual stays in step with the flighty flutes and piccolos, with each instrument sounding organised and distinct even when it builds to a crescendo. Rivals from Rega, Pro-Ject and Audio Technica at this price may have a grander, punchier and more nuanced way with your records, but there’s plenty to praise about the Dual MTR-75. Its features set is exhaustive, and the fully automatic operation makes it easy to live with – crucial if you’re a little nervous about the mechanics of record replay. And you will with the Dual turntable. It’s an affable, enjoyable performer that’s fun to use. Give it a spin.